Spring seems to have arrived early in the mountains of North Carolina. We are surrounded by an abundance of spring flowers. With spring in the air, we decided to head off on hike to High Shoals Falls. On this moderate 2.6 mile round trip hike in Hiawassee, Georgia, you get to experience not one, but two stunning waterfalls (High Shoals Falls and Blue Hole Falls). On this trail, you will travel through a beautiful, lush valley that offers prime backpacking campsites. The first waterfall you come to is called, Blue Hole Falls. While not as big as High Shoals falls, it’s still breath-taking. This single-drop waterfall goes into a deep pool below. This is such a beautiful area, and one that our family enjoying spending a little time at. After spending time at Blue Hole falls, it was time to venture on to the next waterfall on the path. High Shoals Falls. In order to get to this fall, you retrace your steps to the main trail. Once back on the main trail, the hike will start to descend and has switchbacks and a stone staircase. You can definitely hear the roar of the waterfall through the valley the closer you get. 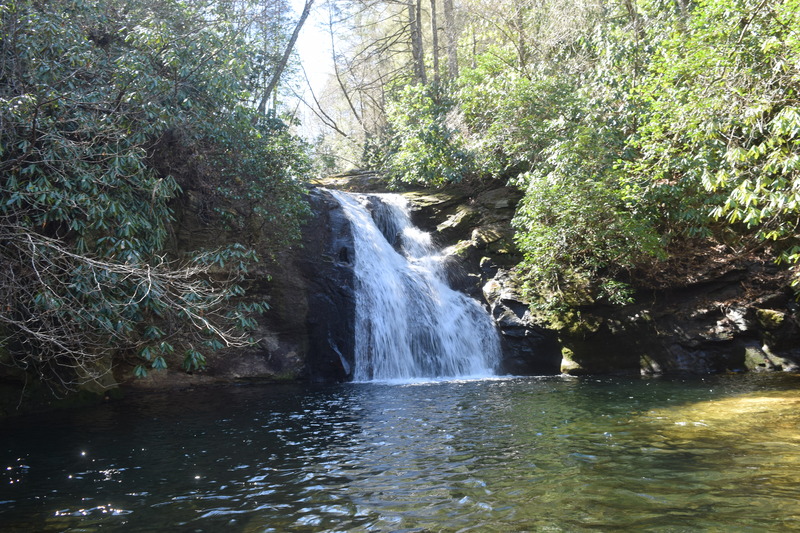 High Shoals Falls is equally as beautiful as the Blue Hole Falls, and offers a a generously sized viewing deck. We spent time here and let the boys enjoy a snack, while we admired this fall. Upon leaving High Shoals Falls area, you’ll retrace your steps to the main trailing. It’s quit the climb on the way back out, but completely worth it!